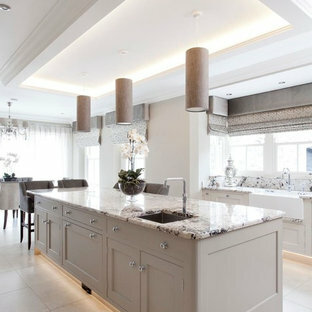 This is an example of a large contemporary l-shaped open plan kitchen in West Midlands with white cabinets, stainless steel appliances, light hardwood flooring, beige floors, white worktops, a submerged sink, flat-panel cabinets, grey splashback and an island. 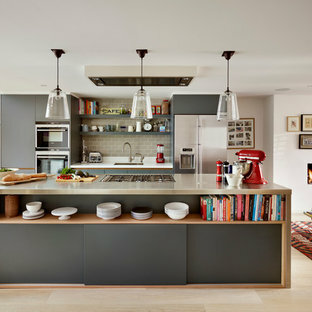 This is an example of an urban u-shaped open plan kitchen in London with flat-panel cabinets, stainless steel worktops, stainless steel appliances, an island, grey floors and grey worktops. Roundhouse Urbo handless bespoke matt lacquer kitchen in Farrow & Ball Downpipe. Worksurface and splashback in Corian, Glacier White and on the island in stainless steel. Siemens appliances and Barazza flush / built-in gas hob. Westins ceiling extractor, Franke tap pull out nozzle in stainless steel and Quooker Boiling Water Tap. Evoline Power port pop up socket. Inspiration for a contemporary open plan kitchen in Other with a double-bowl sink, flat-panel cabinets, dark wood cabinets, ceramic splashback, stainless steel appliances, dark hardwood flooring and white worktops. 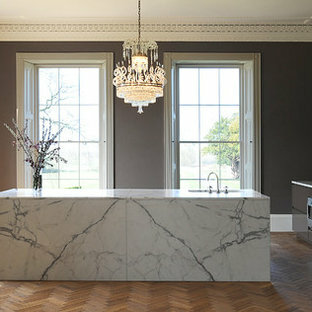 Artichoke worked with the renowned interior designer Ilse Crawford to develop the style of this bespoke kitchen in a Grade II listed Regency house. We made two furniture ‘elements’ providing the main functions for the kitchen. Care has been taken not to interfere with the original interior architecture of the room. Tall Georgian windows enable light to flood over the furniture as well as providing delightful views of the grounds. Limited palettes of fine quality materials help create the feeling of an art installation, enhancing the drama of this fabulous room. Primary materials: Bookmatched Statuary marble and hand burnished gloss pigmented lacquer. The kitchen scullery is in English oak, finished in soap, a traditional Georgian period finish. 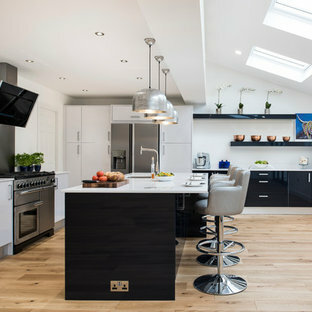 Photo of a medium sized contemporary l-shaped open plan kitchen in London with medium hardwood flooring, a submerged sink, flat-panel cabinets, grey cabinets, grey splashback, metro tiled splashback, stainless steel appliances and an island. 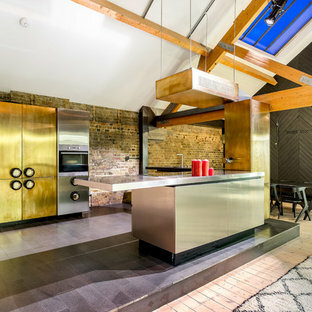 Photo of a large urban open plan kitchen in London with a submerged sink, flat-panel cabinets and medium hardwood flooring. 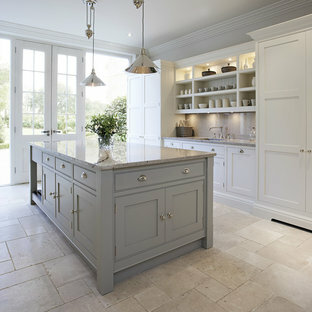 This is an example of a traditional open plan kitchen in London with shaker cabinets, grey cabinets and an island. 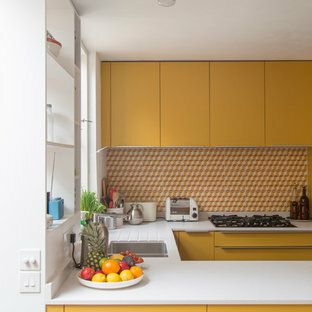 Photo of a large contemporary l-shaped open plan kitchen in London with a double-bowl sink, raised-panel cabinets, distressed cabinets, composite countertops, beige splashback, glass tiled splashback, stainless steel appliances, limestone flooring and an island. 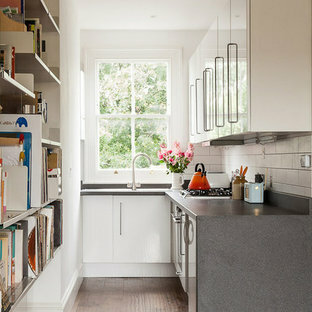 Design ideas for a medium sized contemporary single-wall open plan kitchen in London with shaker cabinets, grey cabinets, stainless steel appliances, a submerged sink, granite worktops, porcelain flooring, an island and grey splashback. 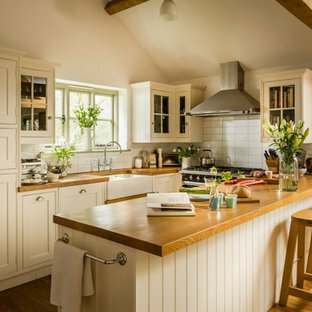 Having moved from London to the Suffolk coastline, our clients were keen for their kitchen to reflect the stunning countryside and shoreline which surrounds them. The weathered oak used on the kitchen island gives the room an earthy, organic feel. The lighting both in the kitchen and over the dining table was an important feature for our clients, they had a strong sense of how they wanted their space lit and so the use of multiple pendant lights was considered during the design process. Kitchen island made of granite top and walnut shelves underneath. Copper net in a sliding metal frames to split the kitchen and the dining rooms when needed.